Rapid Redux galloped into the history books at Mountaineer Park in West Virginia with his 20th consecutive victory on Monday night, surpassing the previous modern-day North American Thoroughbred racing record of 19 wins in a row established by the once-beaten Horse of the Year, Zenyatta, and the undefeated New Mexico bred mare Peppers Pride. Ridden by Deshawn Parker, the leading North American rider by wins in 2010, the 5-year-old Kentucky-bred gelding by Pleasantly Perfect, owned by Robert L. Cole Jr. and trained by David Wells, went wire to wire in the one-mile starter allowance contested over a muddy track, winning easily by four lengths. Rapid Redux won with consummate ease – Parker never using the whip – against three overmatched rivals. The race originally drew a field of 11, and by Saturday is was down to eight, then scratched down to five runners when they began the post parade. Spiritwood was a late veterinary scratch as the field approached the starting gate, leaving just four runners. Rapid Redux grabbed the immediate lead, coasted through fractions of :24.70 for the opening quarter-mile, :48.44 for the half and 1:13.88 for six furlongs, then completed the mile in 1:40.04. A 4-year-old Malibu Moon filly, Lady On Fire, who two races back at Mountaineer won by 13 1/4 lengths, made a brief run at the leader on the turn for home but was never a serious threat, finishing second. Sunshine Kid finished third, with Sunshine Bo – who chased Rapid Redux in the early stages of the race – tiring to be last of the quartet. As a heavy favorite in the wagering, Rapid Redux paid $2.20 to win and place. There was no show wagering. Bred in Kentucky by Fortress Pacific Equine, LLC., Rapid Redux was winning for the 26th time in 40 career starts. Rapid Redux was purchased for $85,000 as a yearling at the 2007 Keeneland September Sale. He has campaigned for three different ownerships. His purse earnings during the streak have totaled $227,494. Most of his victories, like Monday's record-breaking tally, were accomplished in wire-to-wire fashion, by open lengths, his average margin of victory about 4 1/2 lengths. The closest Rapid Redux has come to defeat was March 19 when he just held on to win by a nose over Critical Acclaim at Penn National. 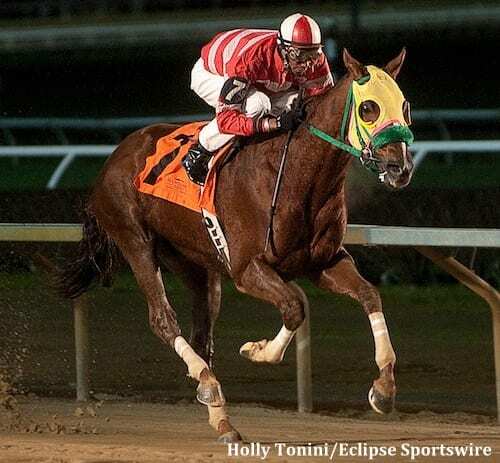 During his win streak, Rapid Redux has been ridden by seven jockeys – David Cora, Sheldon Russell, J. D. Acosta, Kenny Santiago, Vladimir Diaz, Weldon T. Cloninger Jr. and Parker. The distances he has won at during the streak have ranged from five furlongs to 1 1/8 miles. Zenyatta's 19-race winning streak came over four racing seasons, from 2007-10, with 17 of her victories coming in Graded stakes. The lone defeat for the three-time female champion and 2010 Horse of the Year came in her 20th and final start when defeated a head in the Breeders' Cup Classic by Blame. Peppers Pride never left her home state of New Mexico while winning all 19 of her career starts from 2005-08. None of the races was in Graded stakes. Rapid Redux has a long ways to go to catch Cameraro, who won 56 in a row in Puerto Rico in the 1950s. The Hungarian mare Kincsem is believed to have won 54 races in the late 1800s. What's next for Rapid Redux? Wells and Cole have pre-entered him in the $50,000 Iron Horse Stakes, a 1 1/16-mile event which is part of the Claiming Crown program at Fair Grounds in New Orleans on December 3. The Iron Horse is for three-year-olds and up who have run for claiming tags of $7,500 or less during the past two years. It would seem to be a good fit for Rapid Redux, and a win would gain him his most lucrative paycheck to date. But the Fair Grounds stretch is one of the longest in North America – 1,346 feet (as opposed to the 905-foot stretch at Mountaineer). Fair Grounds doesn't favor front runners, especially in two-turn races. There's a 1 1/8-mile starter allowance race at Charles Town this coming Saturday, November 26. Running in that would require a very quick turn-around for Rapid Redux, “but he loves that track, and it's within possibility,” said Wells. And there's a 1 1/8-mile starter allowance race in the Laurel Park condition book for December 1. And a one-mile starter allowance race in Parx Racing (formerly Philadelphia Park) condition book for December 3. And a one mile and 70-yard starter allowance race in the Mountaineer condition book for December 9. Wells said that these races “remain possibilities,” and that officials from all the aforementioned tracks have been urging him to ship in with Rapid Redux. It seems safe to conclude that never before has a starter allowance competitor generated so much interest at so many places on the Thoroughbred racing map. This entry was posted in Ray's Paddock and tagged Cameraro, David Wells, deshawn parker, Horse Racing, Mountaineer Casino Racetrack, mountaineer park, Paulick Report, pepper's pride, Pleasantly Perfect, Rapid Redux, Ray Paulick, Robert Cole Jr., thoroughbreds, winning streak, winning streaks, zenyatta by Ray Paulick. Bookmark the permalink.